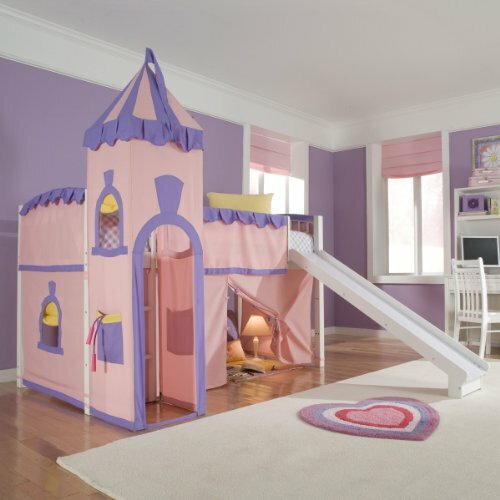 Put a little castle in your little princess' room with the whimsical Schoolhouse Princess Loft Bed. This fun pink and lavender tent bed is the perfect playhouse. The under-bed tent area is great for playing house, tea parties, and more, and a slide makes getting out of bed fun. It's durably constructed of hardwood and available in several finishes. The ladder can be assembled on either side of the guardrail. Fits twin mattresses. If you have any questions about this product by New Energy, contact us by completing and submitting the form below. If you are looking for a specif part number, please include it with your message.